This came in my email inbox today. While my heart has been breaking for the people of Gaza, I have been wrestling how to respond to yesterday’s news about people flooding into Egypt. When I read this, I thought it well worth sharing. The people of Palestine have done it again, taking their own fate in their hands after being let down by their own “moderate” political leadership and, indeed, the entire international community in their struggle for freedom. Early this morning they simply blew up the wall separating Gaza from Egypt, breaking a siege imposed on them by an Arab government in collaboration with Israel. We, the peoples of the world, should take great pride and encouragement in this quintessentially civil society refusal to accept subjugation, to abandon their fate to governments, including their own, for whom the lives of ordinary people are simply grist for their political charades – Annapolis and its subsequent “peace process” being but the last cynical expression. For the Palestinians represent far more than just themselves. Their refusal to submit to the dictates of governments, or to governments’ lack of interest in the well-being of people in general, reflects the desire of billions of oppressed people for identity, freedom, a decent life and actualization of their collective and individual rights and potentials. Most of the oppressed, the “wretched of the earth” as Franz Fanon called them a half-century ago, are too preoccupied with the daunting daily struggle for survival to organize and resist. Others do resist in a myriad of ways, but are most often repressed by their own political and economic “leaders,” disappearing anonymously from view. In a few cases they have managed to mount effective resistance to oppression, even to prevail – though the billions spent on “counterinsurgency” warfare by the US, Europe, Russia, Israel and many “developing” nations augur ill for peoples attempting to overthrow oppressive regimes. In this the Palestinians stand at the forefront, in the front lines of peoples’ insistence everywhere that their rights, well-being and fundamental values as human beings be respected by governments. And they do so (and I write this as an Israeli with great sorrow and shame) against one of the world’s strongest and most ruthless military powers – a power that has dispossessed them from 85% of their land, which is trying to transform its occupation into a permanent regime of apartheid, which has spent decades impoverishing and disenfranchising them; the fourth largest nuclear power which nevertheless casts itself as the victim. Not only have the Palestinians experienced the dehumanization all oppressed and colonized peoples experience, not only have they been made into the embodiment of the rich and powerful’s greatest fear, evil “terrorists” who may tear down their privileged “civilization,” but they have been turned into guinea pigs. Israel is able to gain an edge in the counterinsurgency industry and win entree into the heart of the American military/hi tech complex by turning the Occupied Territories into a laboratory for the development of fiendish weaponry and tactics intended for use against people. And yet the Palestinian people – and in particular those who remain sumud, steadfast, in Palestine – continue not only to resist but to surprise and confound its would-be Israeli master at every turn. Despite unlimited control, a complete monopoly over the use of force, utter callousness and a vaunted Shin Beit, Israel’s military intelligence, Palestinians vote as they want, resist, carry on their daily lives with dignity – and blow huge holes in the walls and policies constructed in order to imprison and defeat them. All this is not on the minds of those desperate people who surged into Egypt today. They may not have the “Big Picture.” Yet they deserve the respect and gratefulness of every person who cherishes a better world based on human rights and dignity, a world that is inclusive. As an Israeli Jew, I have been saddened and mortified that my own people, after all they have experienced, cannot see what they are doing to others. But on a larger scale, not as an Israeli Jew but as a human being, I take heart in the Palestinians’ active refusal to be ground under a global system that is producing unimaginable wealth and power for a few at the expense of the growing ranks of the wretched. I am not a Palestinian; I am not one of the oppressed. I only hope I can use my privilege in an effective way in order to redeem the gift the people of Gaza have given all of us: the realization that the people do have power and can prevail even in the face of overwhelming power. We may each express our responsibility towards the people of Gaza in whatever way most suits us, but as the privileged we must do something. We owe the Palestinians and the Palestinians writ large at least that. (Jeff Halper is the Coordinator of the Israeli Committee Against House Demolitions (ICAHD). All of us here have been shaken by the news coming out of the Jordanian capital of suicide bombings in three hotels. 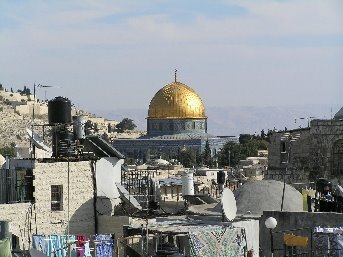 Al-Qaeda has claimed responsibility, saying that the attack was meant to target the “Jews and Crusaders.” This is the kind of rhetoric which feeds the assumption that we are facing what Bernard Lewis has famously phrased a “clash of civilizations,” a massive conflagration between East and West. Yet the deadliest of the attacks hit the heart of a Muslim wedding party. The next day, at the same hotel a Christian wedding party took place. It seems to me that this points to a struggle not between East and West, but within Islam itself. Scholars like Reza Aslan (e.g. his book No god but God) and Mohammad Sammak see the dividing lines between those seeking radicalization and those seeking modernization. My own experience with the Palestinian Islamic community underscores this analysis. Half of those killed in the wedding party were Palestinians from Jenin. In Jerusalem, all news seems to be local news. I did take the opportunity yesterday to walk the ramparts of the Old City walls, a walk that was closed during my time here “due to security reasons.” It was an amazing walk that takes you half way around the city. On the left, you see the life outside the walls (and the architectural beauty that the walls themselves are). On the right, you see life within the Old City: houses, churches, playgrounds, settlements, schools, workshops. It is a helpful reminder that Jerusalem is not just a symbol, not just an idea. It is, first and foremost, a place where people live. It is for the sake of these people that we should seek peace.